I’ve already told you about how the Chargers are cruising around San Diego to meet fans for their #ThankYouSD campaign. Pretty cool. That’s a fan up top with Manti Te’o. Harmless photo. Well, that same fan also posted a Vine video. See below. I’ve watched it 600* times, and it looks like he’s running for his life, no? This short dude is chasing him? And Te’o kinda turns over his shoulder, startled and wide-eyed that this little fella is on his tail. Am I right? Am I nuts? 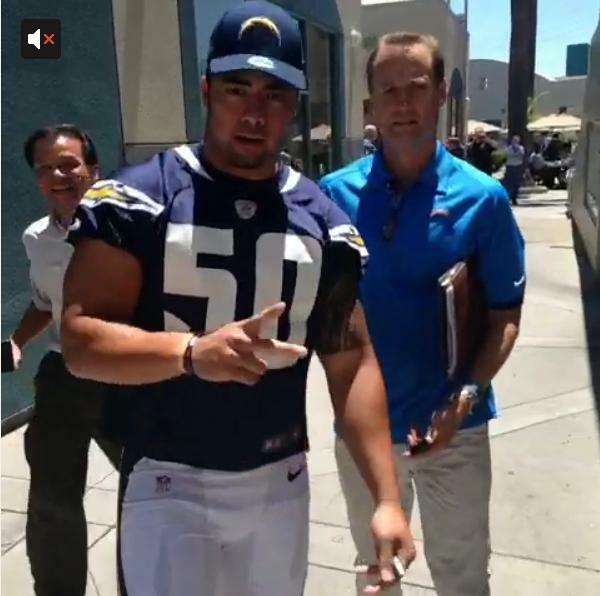 That’s Chargers Director of Public Relations, Bill Johnston, running with Manti. They both kind of realize the guy is harmless at the same time, so nothing really happens, but still. Really weird. Because it wouldn’t surprise if that Vine is taken down, here are a couple of screengrabs. It’s no mistake that out of every player on this roster, Bill Johnston is by Manti Te’o’s side. 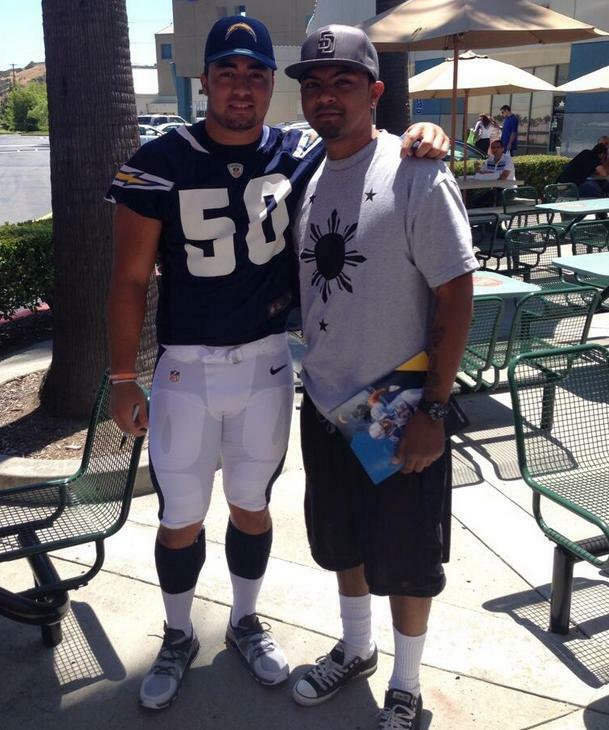 We all know that the Chargers have made Te’o unavailable to the media, so of course, they’re not gonna let him get cornered by some randoms on the street while the team is doing a meet and great with the community. 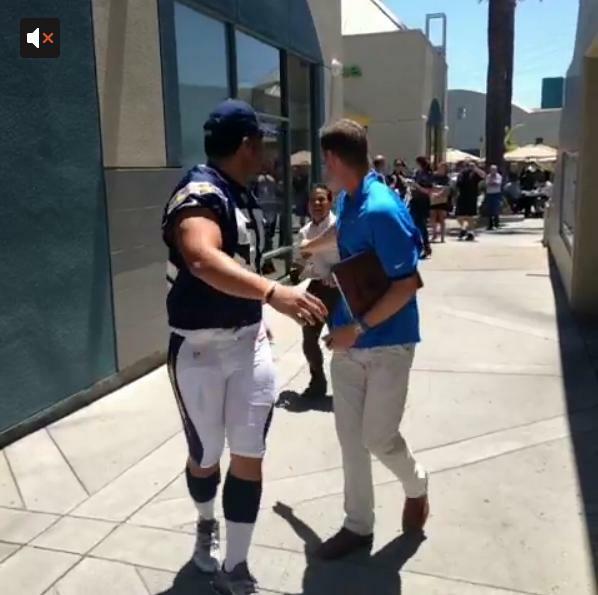 Pretty funny though to actually see a visual of the PR director and Manti literally running away from fans. Dude hasn’t even played a down in the NFL and he’s running away from fans like Michael Jackson had to in the 80’s. Is this real life? This entry was posted in Football, News, NFL and tagged Manti Te'o, manti teo running from fans. Bookmark the permalink.